Will has really gotten into playing over the last couple of weeks. 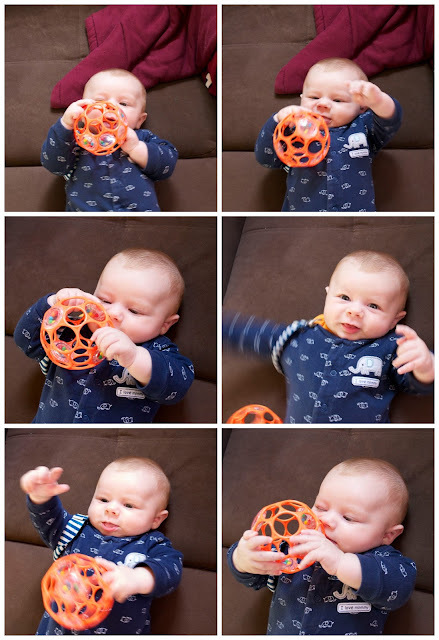 His grasping skills are really improving and with it his love for pulling/kicking/swatting/shaking the following. This thing is pretty awesome in my opinion. It is a Rhino Oball Rattle and Will can easily hold it with one or both hands, mouth it, shake it and throw it. If you give it to him in the car seat it will eventually make its way to his feet and he'll kick it around and try to lift it up with his feet. Basically, he loves this thing and the only reason it's the runner up is that him chucking it requires us to basically be the dog in a game of fetch. We have the Skip Hop Forest Friends Activity Mat and Will will spend a solid hour playing with the animals and "talking" to them as you can see in the video. He really likes grabbing on to the center ring. The fact that no matter how hard he kicks/swats at the animals they stay right above him is a huge bonus to other toys that we have. I also really like the colors of this mat as well as the variety in the hanging toys. Right now we use this mat mostly for when Will is on his back but occasionally use it for tummy time as well. As he gets older, there are things like squeekers and crinkly leaves in the mat itself for him to play with.